This power recliner is about more than comfort and transitional style, it's also full of high-class features. 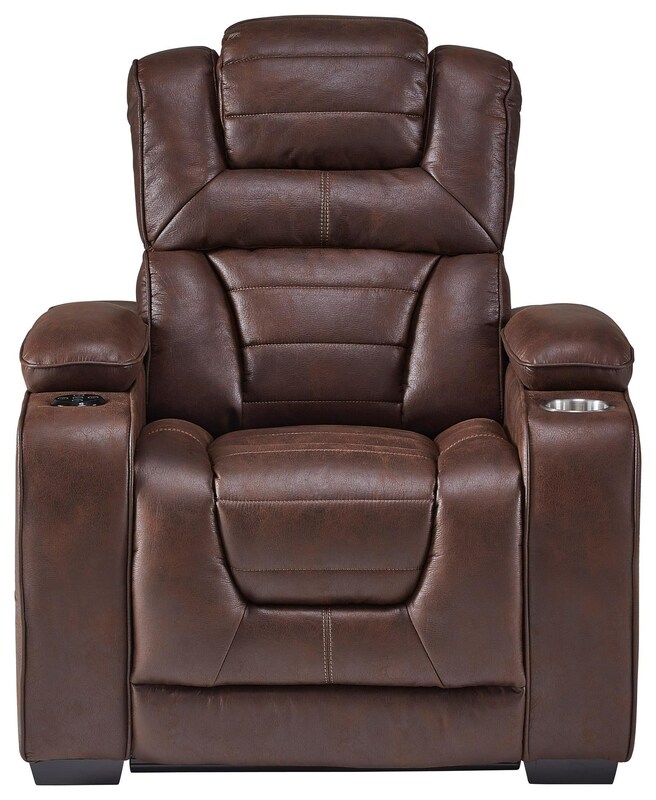 This recliner features power recline and an adjustable power headrest. It also includes bluetooth speakers, a steel cupholder, in-arm storage in both arms, bucket seating and channeled cushions for long-lasting comfort. The Desert Chocolate Power Headrest Recliner with Bluetooth Speakers by Corinthian at Great American Home Store in the Memphis, TN, Southaven, MS area. Product availability may vary. Contact us for the most current availability on this product. Padding & Ergonomics 1.8 density, 28-30 lbs PSI compression foam in seat cushions. Poly Dacron filled back cushions. This collection is full of transitional style and high class perks. In addition to power reclining, the items in this collection offer an assortment of benefits including; drop-down table with cup-holders (sofa), storage console with cup-holders (console loveseat) and even power headrests with built-in blue-tooth speakers (unpictured recliner). The Desert Chocolate collection is a great option if you are looking for Transitional furniture in the Memphis, TN, Southaven, MS area. Browse other items in the Desert Chocolate collection from Great American Home Store in the Memphis, TN, Southaven, MS area.